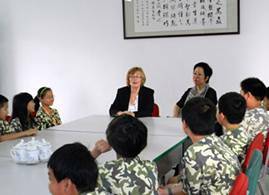 On October 19th, Ms. Maggie, the head of teaching department in Maple Ridge Educational Bureau (42 School District) and Ms. Jannie who was the head of International Affairs came to visit our school. 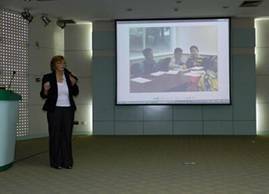 Director Yang Fan from international communication center warmly received them. 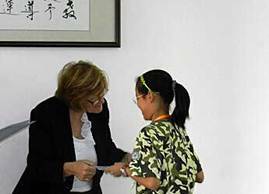 In 2008, our school had signed the MOU with Maple Ridge Educational Bureau in Canada (42 SD). Since 2009, we had jointly implemented our overseas project of fifth grade students, Winter Camp and summer camp in Canada with Maple Ridge Educational Bureau (42 SD). Up till now, there had been more than ten leaders and teachers, and over a hundred students had come to Canada to study and travel. 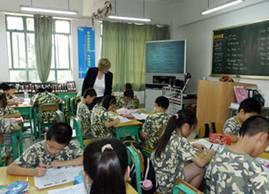 The overseas studying project of fifth grade students had been very popular among students and parents. 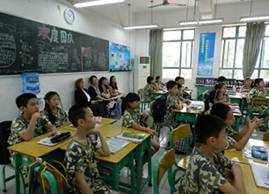 In the second term of the fifth grade, students and parents could submit application for the project, and after gaining the approval of Canada and the school, students could study in Canada from February to June that year. 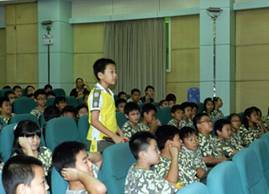 Upon arrival, students would stay with homestay families. They were assigned to the fifth to seventh grade of different schools to study with local students according to their English proficiency. Each school would have no more than two Chinese students. The advantage of this project was to let children live with local homestay families to experience western family life and culture. They could study in local schools, take local courses and immerse in English environment. The English ability of students would be hugely improved and they would gain deeper understanding of western culture. The visit of those two guests was the return visit to the students and teachers who had previously been to Canada, they also evaluated the fifth grade project for this year and students in winter campus. Ms. Maggie and Ms. Jannie had attended the class of Fourth Grade Class Four. 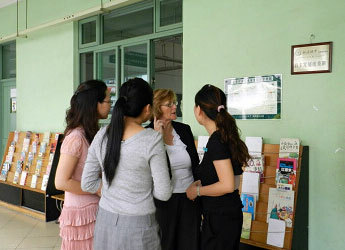 When seeing students were divided into groups to practice English, Ms. Maggie was very excited, she told Director Yang Fan, who was beside her, that “This is how we do in Canada”. Those two guests had also met some representatives of teachers and students who had studied and lived in Canada, they recalled their happy memories together and had a great time. Maggie and Jannie also asked the current study condition of the students who had studied in Canada. Ms. Jannie was as happy to see those students had grown up, just like seeing her own children grown up. she also expressed her gratitudes to head teachers. In the afternoon, they finished their visit and left the school.